A few days ago, I wrote about the wasps that are eating many of the beautiful caterpillars that I have seen dining on my plants. Since we don’t use any chemicals that we consider harmful to the environment, we are always looking for alternative means of getting rid of the pests we don’t want and encouraging the critters that we do want. With that in mind, a few years ago I ordered several kinds of beneficial insects online. I had previously purchased a bag of ladybugs from my favorite local garden center, but they immediately flew away when I released them, so I decided to try a few more insects ….and to better follow the directions this time. Ladybugs - Both the adult and larval ladybugs help control aphids, scale, mealybugs, spidermites and whiteflies, as well as other insects. 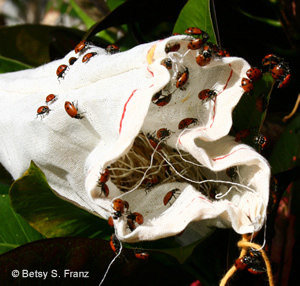 The adult female ladybug lays up to 50 eggs per day, usually on the upper side of leaves of infested plants. The eggs hatch into orange and black marked larvae which can consume 400 or so aphids during this 29 day stage of their life. Ladybugs live about 11 months as adults. Live ladybugs can sometimes be purchased from local garden centers. In many instances, 90 to 95 percent of the ladybugs you release in your garden will immediately fly away. To increase the number of retainees, follow these suggestions: water the site before releasing the ladybugs or release after a rain; release the bugs in the evening, never in the heat of the day; have plenty of their favorite plants in your landscape. Another suggestion is to release only a few ladybugs at a time, over a period of about a week, instead of emptying the entire bag all at once. The rest can be stored in the refrigerator (NOT in an airtight container!) until their release. After releasing the ladybugs into my garden, I was quite impressed that many of them stayed around for weeks and even months. I did not do anything to retain them, but I did have a plant that was well infested with aphids. However, I rarely see ladybugs in our yard now so they haven’t seemed to stay around over the years. Green Lacewings – Many sources cited lacewings as the most effective predators you can buy. They eat aphids, thrips, mealybugs, scale, moth eggs, whiteflies, small caterpillars and mites and are thought to stay around a little better than ladybugs. You can purchase lacewings as eggs, larvae and adults. The larvae are the most voracious form of this insect but it is suggested that they be purchased as eggs and allowed to hatch. Unlike ladybugs, lacewings should be released during the day. Lacewings are less likely to fly away than ladybugs if you provide the adults with sources for food, such as pollen, nectar and honeydew. I ordered my lacewings as eggs (1000 for $11.95) but some had already hatched by the time they arrived, I scattered them around my garden, as directed, and never saw them again. Nor did I see any adult lacewings. However, I have plenty of ants in my gardens and ants eat lacewing eggs and defend aphids from these predators to protect the honeydew that aphids secrete. Therefore, lacewings may not be a good choice if you have too many ants in your plants. Although I rarely see green lacewings now, I DO see their eggs all the time, so I know they are still around our property doing their job. I’m not sure if this has anything to do with the ones we bought for my bug buying experiement, but I guess it could! Praying Mantids – Although praying mantids are readily available for purchase, I read that they were of little use as effective pest control. When small, they are excellent soft-bodied insect predators. However, as they get bigger, they indiscriminately eat anything that passes in front of them including honeybees, butterflies and supposedly, hummingbirds. Because of their indiscriminate eating habits and their poor survival rate, I decided not to buy any. Trichogramma Wasps -These tiny wasps are very popular and very effective Lepidopteron egg parasitoids, which means they are either loved or hated in the garden, depending on whether you like butterflies or not. These wasps reproduce by laying their eggs in the eggs of many Lepidopteron species (butterflies and moths). They are useful for controlling gypsy moths, codling moths, tomato hornworms, cabbage loopers, imported cabbageworms and European corn borers. If you are a butterfly gardener, they will also kill many butterfly species. The adult wasps lay up to 300 eggs each, into the eggs of 300 soon-to-be destructive caterpillars. Instead of pests hatching out, more tiny wasps hatch out from the pests’ eggs. The life span of these parasitoids is roughly seven days in their immature stages, then up to 10 days as adults. To get the right species of Trichogramma wasps for your climate and pests, it is recommended that you discuss your needs with the supplier, which I didn’t do. The wasps arrive ready to emerge from host eggs, which are glued to a card. Timing is critical when introducing trichogramma wasps to your garden. 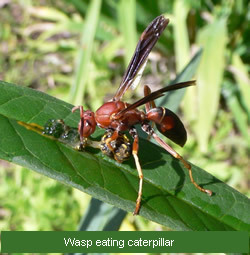 Prey eggs have to be available since the wasps can’t parasitize the larvae. The Trichogramma wasps I ordered came on a small card, which was supposed to have the wasp eggs on it (4000 for $5.75). I could not see them with the naked eye and since I did not have a caterpillar problem in my gardens, I couldn’t really tell whether the wasps emerged and did anything. I have seen an increasing decline in my butterfly larvae population over the years, which I thought may be related to those wasps. However, the wasps I see are eating the caterpillars themselves and not the eggs, so I think they are a different type of wasp. So before you spend your money buying beneficial insects, I suggest that you try to lure them to your yard. As with most things in the garden, all it takes is the right habitat.